Inspired by Asian cuisine flavors, fast, easy, nutritious and yummy! 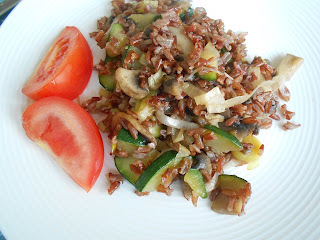 1) Heat oil in a wok or skillet, add zucchini and leek, cook them over medium-high heat for about 3 minutes, add the mushrooms and cook until they lose all the water. 2) Add the rice season with soy sauce and cook until rice is warm.